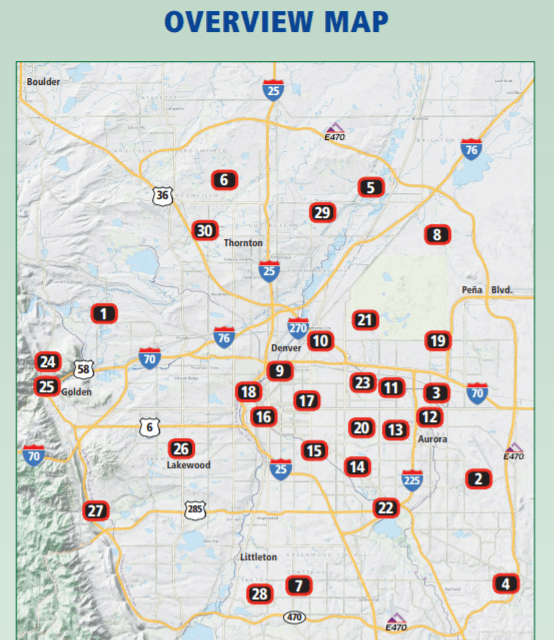 Here is a list of known errors in the first edition of The Best Urban Hikes: Denver. The overview map is off by one on many of the locations. Below is the corrected overview map for page 3. Take Ward Road -CO 72 north to 64th Avenue -CO72, turn left/ west and continue to Indiana St. – CO 72, turn right / north and continue to 68th Ave. turn left / west, take the next right, Joyce St. and follow road around to 6833 Joyce St. before bridge over the trail. ” Thank you to James and Patricia Gilman for the correction. Please let me know if you find other errors while using this Pack Guide. Thank you. We are sorry for the omissions.